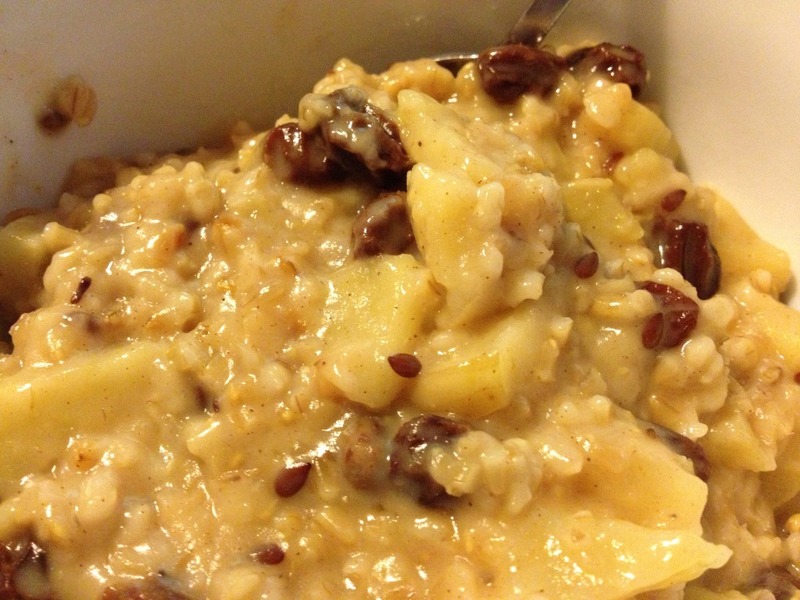 Make-Ahead Apple Cinnamon Steel Cut Oats! 1/10/2018: This is the updated recipe I use now (with or without the Instant Pot)- it’s thicker and more hearty! Now that cooler weather has hit us, I’ve been transitioning into warm, roasty toasty breakfast foods. One comfort food that I am happy to welcome back is this warm-ya-to-yer toes apple cinnamon oatmeal! Mmmm! This is a delicious and heart-healthy way to start your mornings! I prefer steel cut oats over other types because I like the toothsome texture better, and also because they’re less processed (i.e. better for you) than other oat varieties. 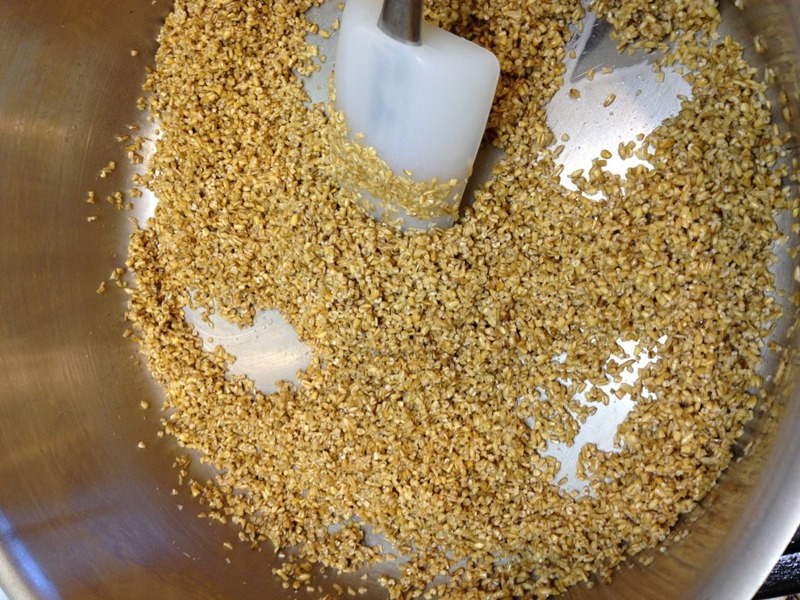 Steel cut oats are oats that have simply been cut into pieces– not flattened, steamed, or steamed-and-then-flattened like some other oat varieties. The major drawback of steel cut oats are that they take about 45 minutes to prepare, and who has time for that every morning? Not I. That’s why I like to make a big batch, freeze it into individual portions, and reheat it for my quick and healthy breakfasts. It’s a little investment of time on a Saturday morning that results in a warm, hearty payoff for the weeks to come! The first few times I made it, I tried using a slow cooker, but that just resulted in burnt oatmeal + a really, really difficult pot to clean. If you’re a slow cooker pro, though, go for it! It is a glorious aroma to wake up to! I make mine with apples and cinnamon to boost the health and flavor factor, but you can do without if you’re short on time. Another option is to add raisins, which soak up the liquids and get nice and plump while adding some sweetness. 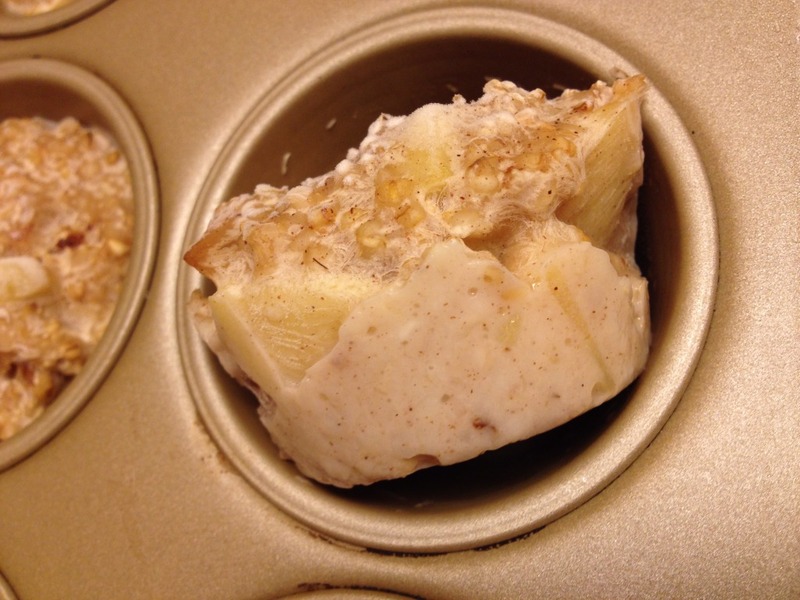 Then I use an ice cream scoop to plop them directly into muffin tins. That’s right, no liners. Trust me on this one. 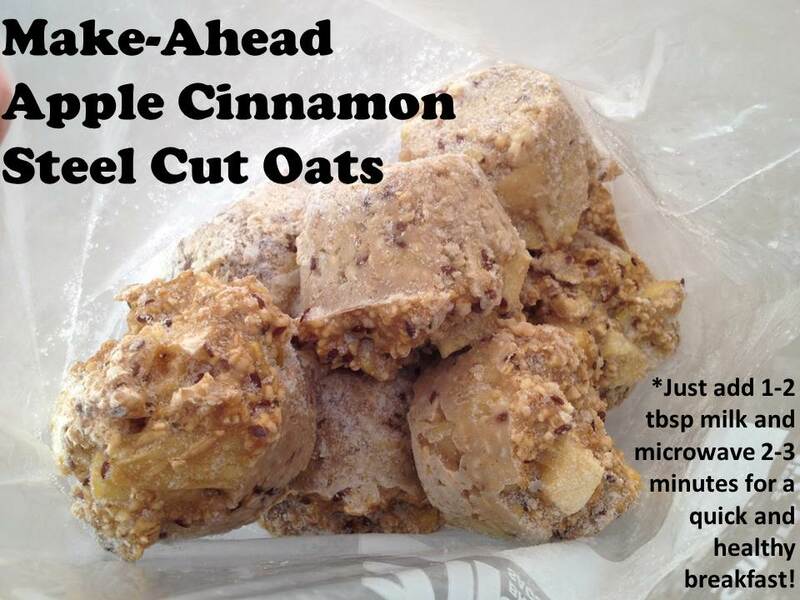 …and reheat with 1-2 tbsp of milk for breakfast in the mornings! If you’re an expecting or nursing mother, there’s another added benefit from these oats! (If you are not, and you get squirmy about these things, I highly suggest you skip this section. 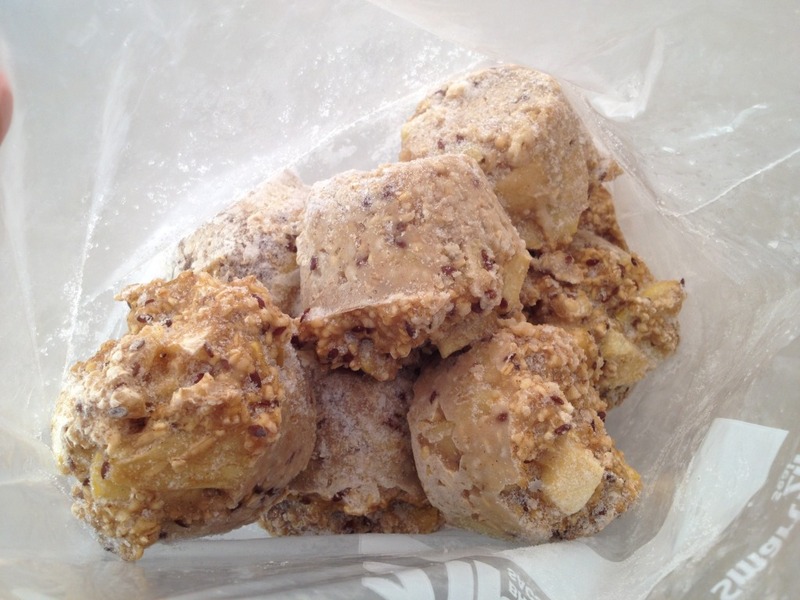 It could ruin oats for you…) Did you know that oatmeal is a galactagogue? During the first few months of nursing, I got mastitis. I know. It was awful. Not only did I feel physically terrible, but after enduring weeks of unimaginable pain to make breastfeeding work, I watched my milk supply plummet. Nooooo!!!!!!!!!!!!! All that pain, and all those weeks of sleeping 1-3 hour stretches to build up my supply… down the drain!!!! So in my hazed, exhausted state, I did some quick research to see how to build supply back up. This is how I learned that OATMEAL is supposed to help increase milk supply! Happily, I had two bags of these frozen oatmeal pucks stored up in the freezer and ate that for breakfast for the next three weeks straight. Not sure if it was my tenacity and/or the oats but it all worked out in the end. It’s almost been a year and I’m proud to say she’s an EBF baby (edit: er, plus solids. so whatever you call that). It was not an easy path, but we did it! This is a healthy breakfast anyway, but if you’re expecting and planning to breastfeed your baby, now you have another reason to consider making a batch of these! I would recommend that you prep and freeze some of these ahead of time, before your baby arrives, so when those sleep-deprived weeks arrive, you can just reheat and enjoy. In a large, heavy-bottomed pot, melt butter over medium heat. Add oats, and stir to coat with butter. Keep stirring until the oats smell toasted and nutty, about 2 minutes, then add boiling water, milk, apples, and raisins and bring to a boil. Once it boils, reduce to a simmer. Cover and keep at a low simmer for 25 minutes, without stirring. After 25 minutes of simmering, stir in sugar, cinnamon, and salt and mix well. Cook 10 minutes more, stirring frequently. If oats are too thick for your liking, add more water. Serve in bowls and top with garnishes. To freeze in individual portions: Use an ice cream scoop to place generous-sized scoops into muffin tins, filling them a little bit beyond the top of each muffin well*. Let cool on counter, then place in freezer and freeze until hard, at least 6 hours. Remove from freezer and place in a shallow pan of hot water for about 20 seconds, or until you can pull at the top of one of the pucks and flip it over. Collect them in a gallon-sized zip top bag and store in the freezer. *In my photos, they’re not filled all the way to the top. I found these serving sizes to be too small, which is why I now recommend filling it beyond the top. 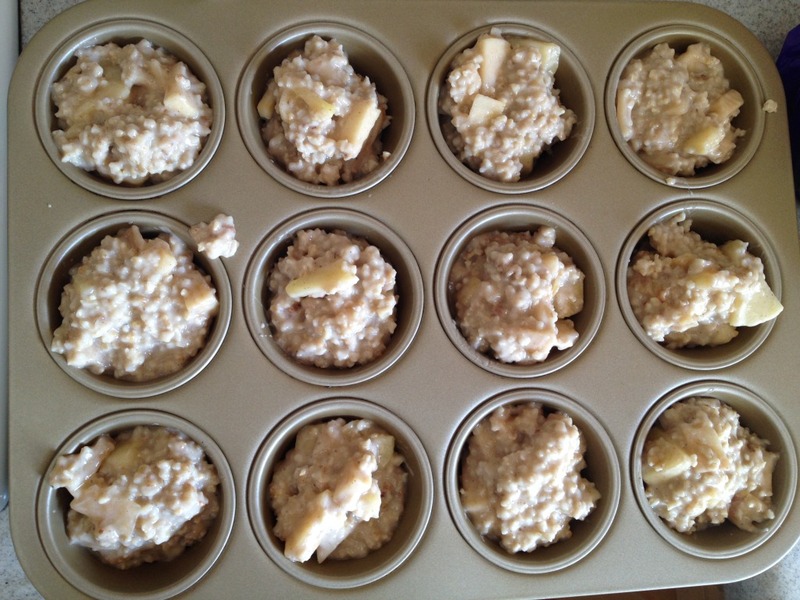 To reheat individual portions: Place an oatmeal puck into a microwave-safe bowl. Add 1-2 tablespoons of milk and microwave on high for 2 minutes. Take it out and stir, mashing down any big lumps, and microwave for 1 more minute. Add any additional toppings (nuts, brown sugar, raisins, etc.) and enjoy! Brilliant! We’ll definitely give this a go at our house. The trick to using the crockpot to make oatmeal is to also use a pyrex measuring jug or a small mixing bowl. The oatmeal goes in the jug or bowl, and the jug or bowl goes in the crockpot. Then (this is the magic part) you put water in the crockpot around the jug or bowl up to the level of the oatmeal inside. Put the lid on, turn it on low overnight, and in the morning you’ll have lovely oatmeal that is not stuck at all to its container, and plenty of hot water to put in the empty jug or bowl so it won’t dry out and get hard to wash while you eat the oatmeal! Interesting idea! Sounds like you’ve got some experience with this 🙂 I’ll try this sometime! Maybe we should finally get a microwave. Wow, still no microwave? That is impressive! Such a great idea! I’m going to make some up this week! Yeah! Let me know how it turns out!